Though much of the country has been strongly evangelized over the years, this part of Guatemala only claims a 3-4% Christian population. There is still a very strong influence of “Mayan practices” which is nothing more than superstition and witchcraft. Often times these practices are mixed with other more traditional religious beliefs to form a belief system that is not based on the Word of God or salvation through the death and resurrection of Christ. Servant Ministries has used many different forms of evangelism over the years. In addition to regular church services, both in town and in surrounding mountain villages, evangelistic crusades are a way of reaching the unsaved. 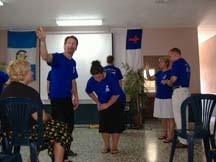 Often teams come from the U.S. and Canada to help in these crusades, participating in the preaching, teaching, testimonies, music, and drama. Another popular way to reach those who don’t know Christ is the projection of Christian videos. Videos are often shown at the ministry center, in the remote mountain villages, or in the town plaza. Placeholder imageSince most people in this area do not own a television, it is quite a novelty for them to see a movie. It often draws people who come initially out of curiosity but end up giving their lives to the Lord. Christian children’s videos are also being shown on a Christian television program in various parts of Guatemala where thousands of children are hearing about the love of Jesus. Other outreaches include youth programs for both children and teens. Sports, music and drama events may be used as a medium to deliver the message of Christ to teenagers. Vacation Bible School has been found to be an effective way to reach the younger children in the area through Bible stories, games and crafts.